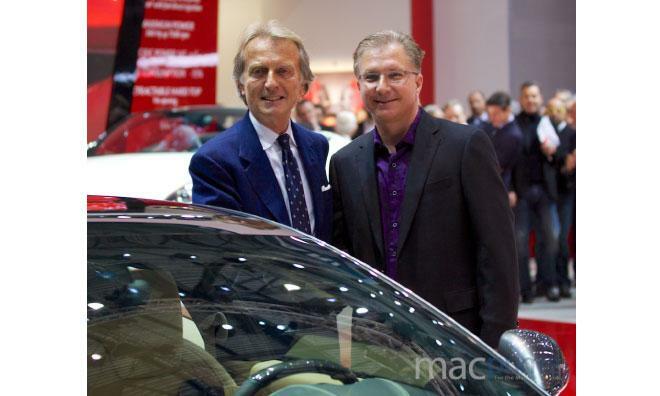 Ferrari chairman Luca Cordero di Montezemolo, left, and Apple marketing executive Greg Joswiak, right. The 80-year-old Italian marque cited Apple as a "key partner for innovation" during their presentation, according to macprime.ch. 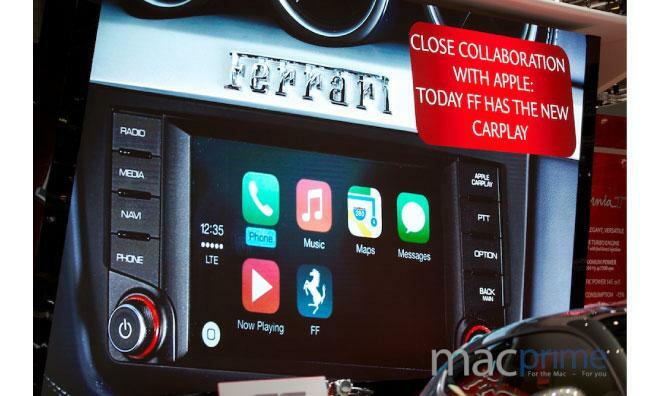 Ferrari is the last of Apple's three launch partners to show off their CarPlay implementation after Mercedes-Benz and Volvo did so on Monday. "CarPlay has been designed from the ground up to provide drivers with an incredible experience using their iPhone in the car," Joswiak said earlier this week. "iPhone users always want their content at their fingertips and CarPlay lets drivers use their iPhone in the car with minimized distraction. We have an amazing lineup of auto partners rolling out CarPlay, and we're thrilled it will make its debut this week in Geneva." Perhaps fittingly, the FF has marked a series of firsts for Maranello, Italy-based Ferrari. In addition to being the automaker's first CarPlay-equipped vehicle, the 651-bhp coupe was also Ferrari's first all-wheel-drive sports car. The presence of Apple executives is not unusual for the launch of such a high-profile partnership, though Joswiak's choice as the company's emissary is somewhat unexpected given other high-level ties between the two companies. Apple Software and services boss Eddy Cue, under whom CarPlay is developed, occupies a seat on Ferrari's board of directors. Apple first unveiled plans for CarPlay, then known as iOS in the Car, during last year's World Wide Developers conference. The rebranded system officially launched this week and will make its way into vehicles from Ferrari, Honda, Hyundai, Jaguar, Mercedes-Benz and Volvo throughout 2014.